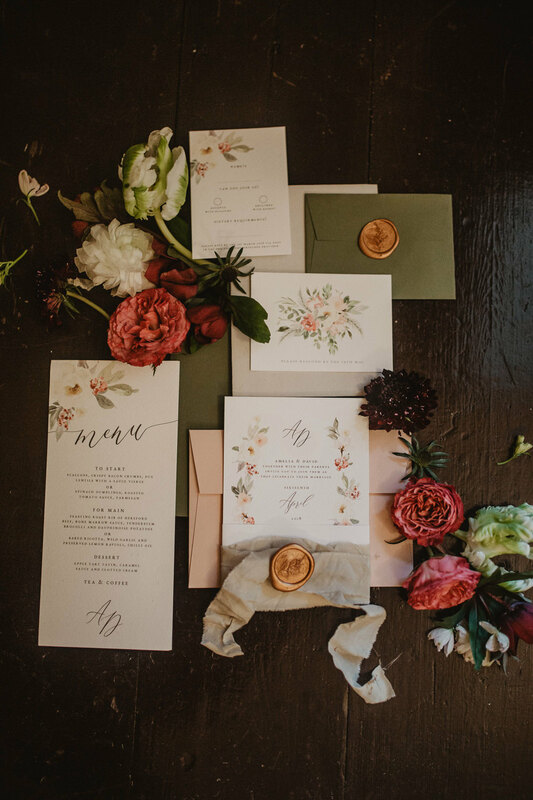 I am very excited to be sharing such glorious wedding ideas, which are totally unique and really very decadent with you today. 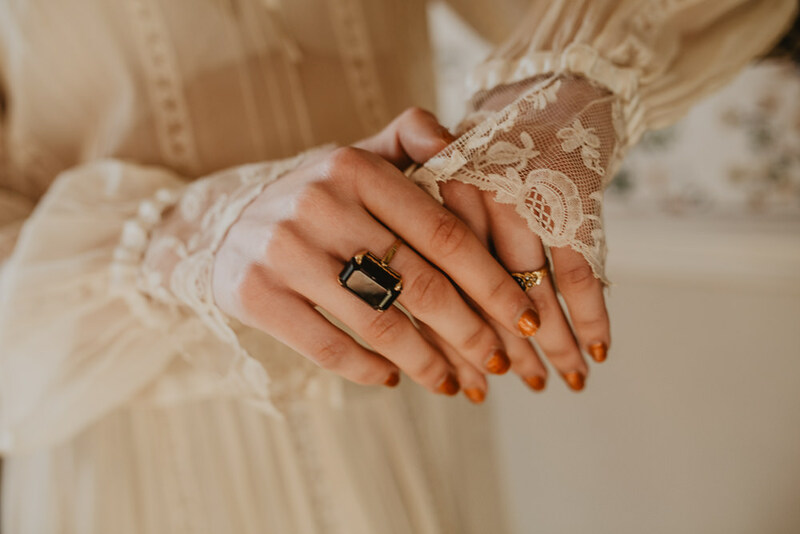 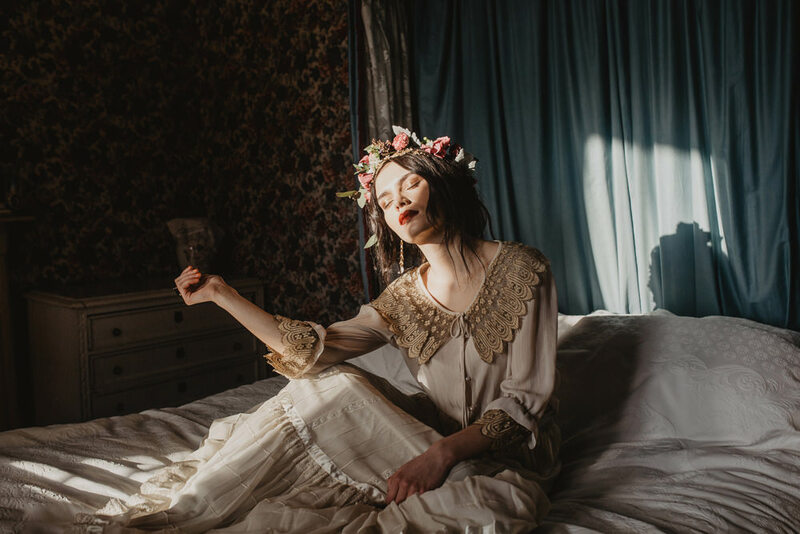 Settle in because we have here a truly beautiful set of images by Camilla Andrea Photography, who also came up with the concept and styling for this editorial shoot. 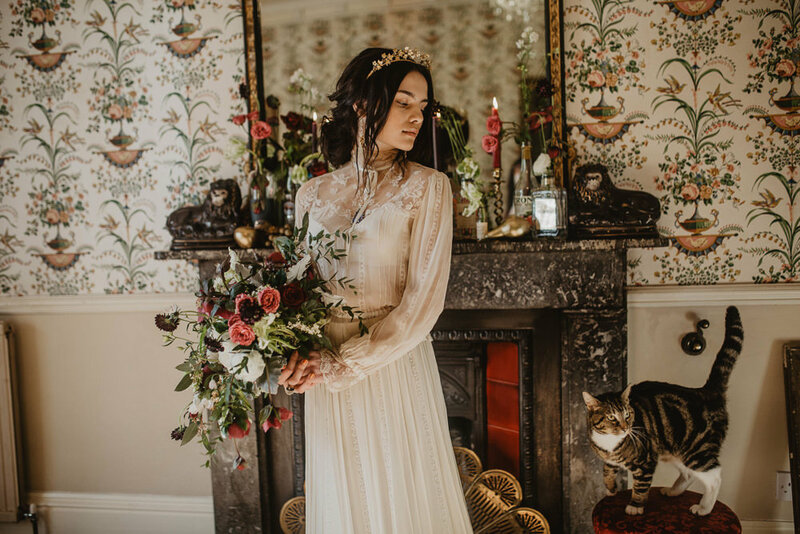 The vision was Edwardian vintage and the results are breathtaking. 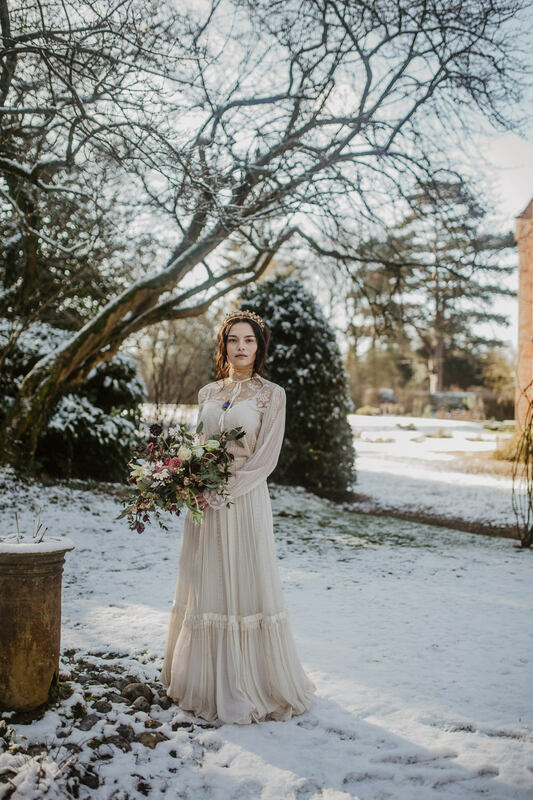 Set at Great Melton Old Rectory in Norfolk with a fine dusting of magical snow, an opulent styled wedding editorial was brought to life. 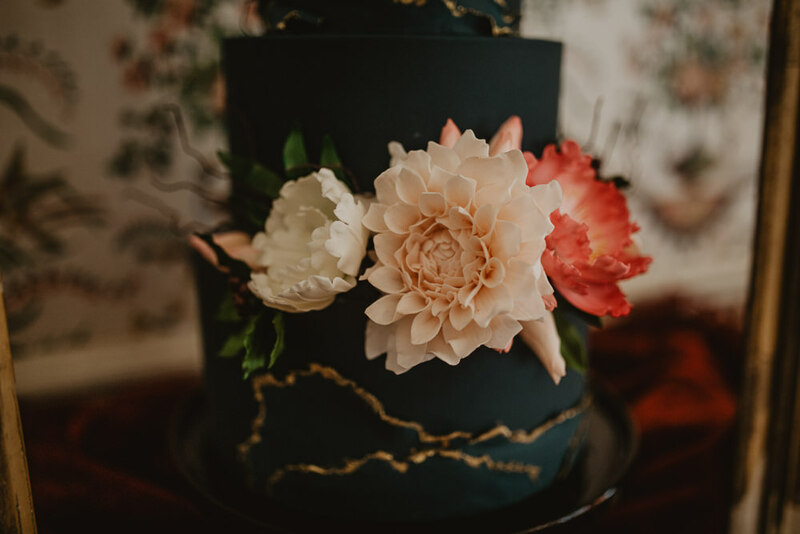 There was a fireplace mantle piece adorned with twinkling candles and blooms in bottles, the prettiest stationery suite, a luxe black and gold cake creation and elegant bridal accessories to name a few. 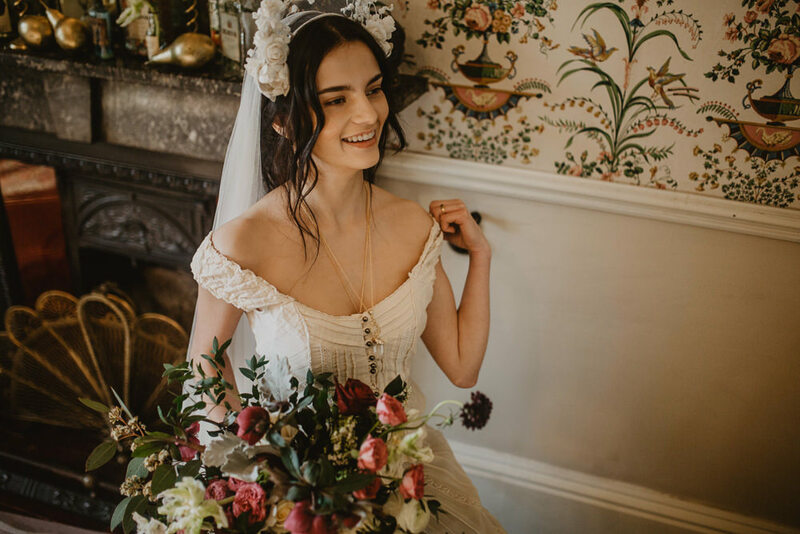 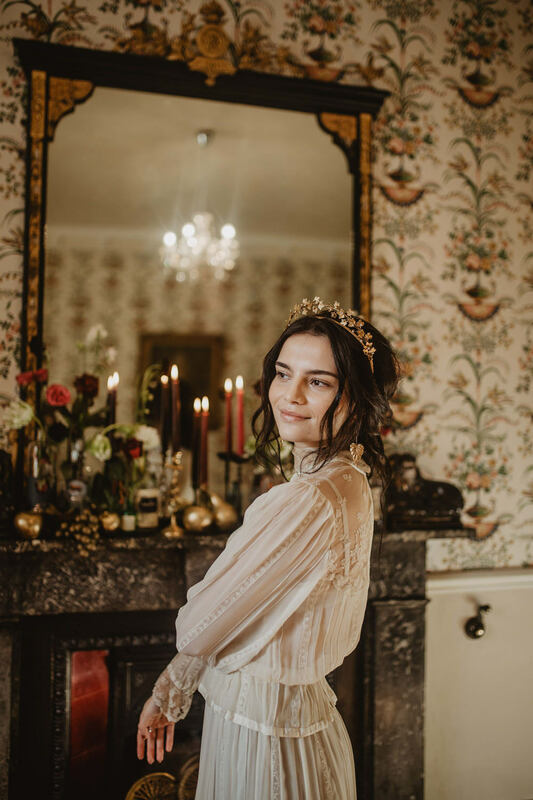 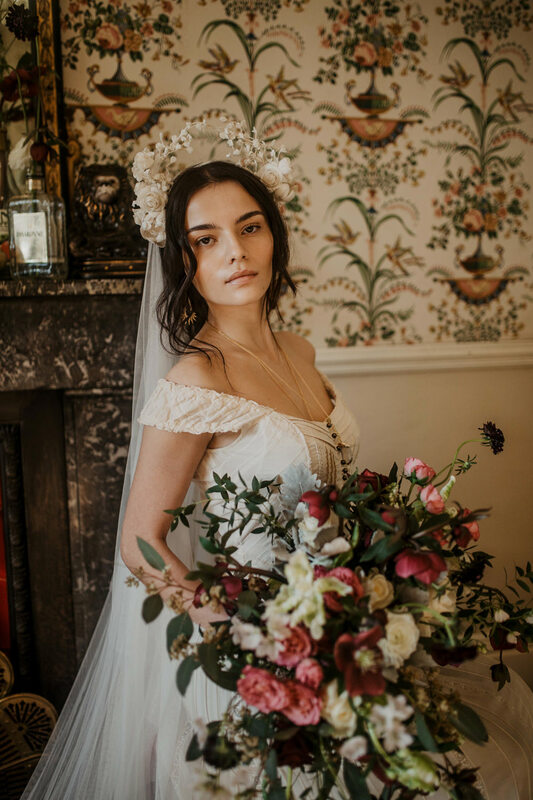 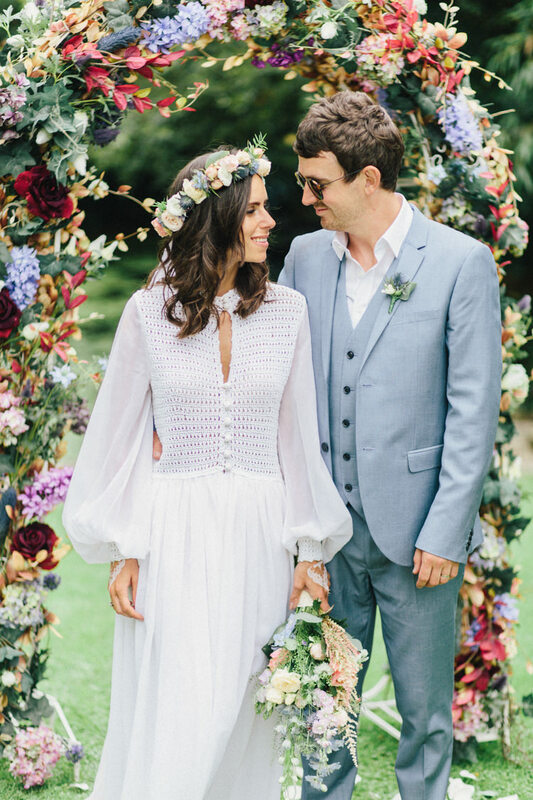 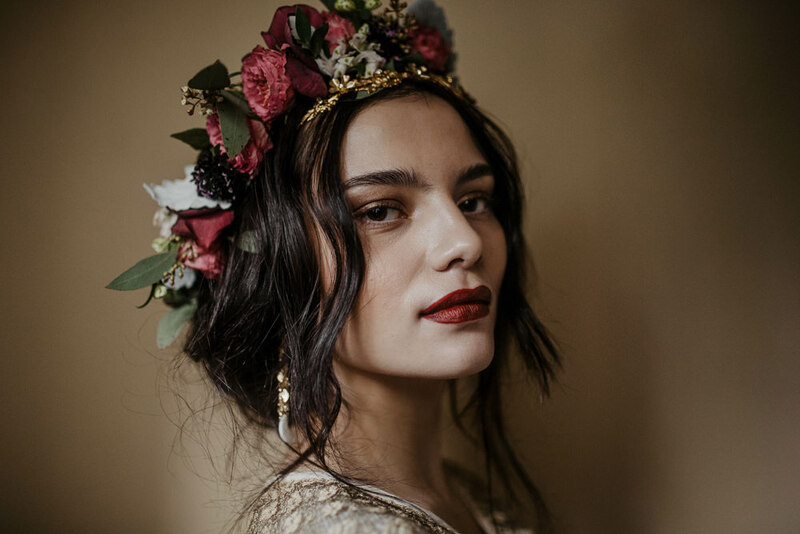 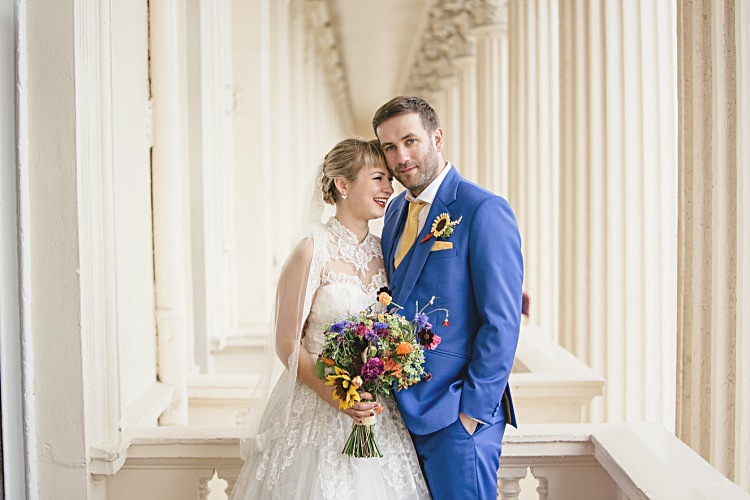 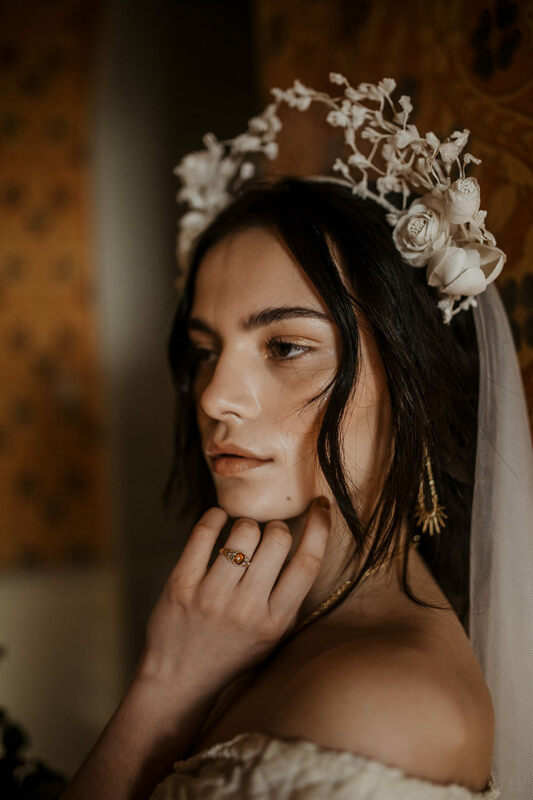 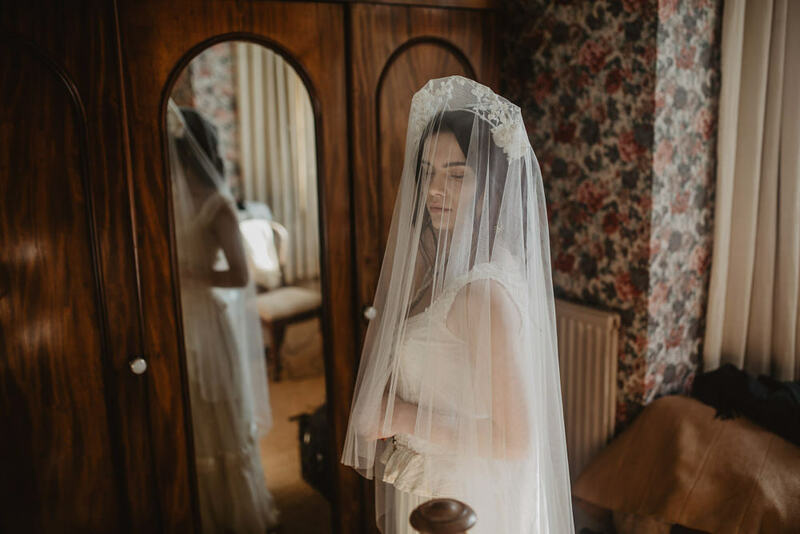 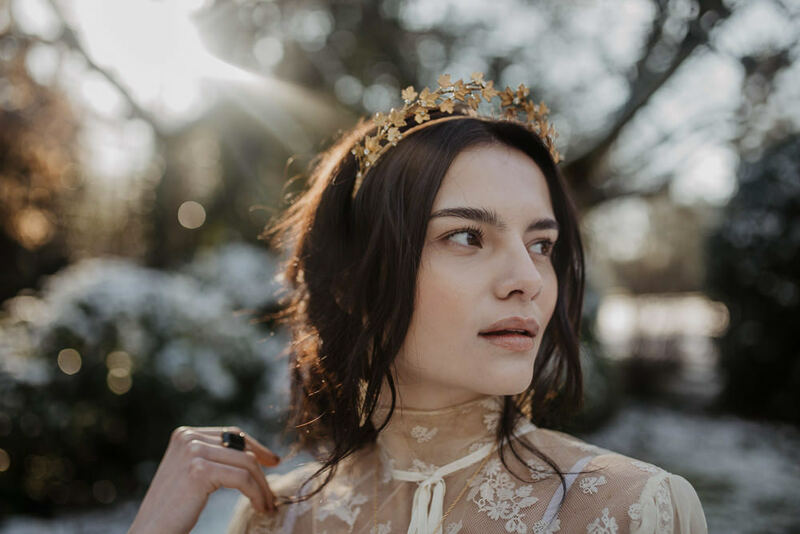 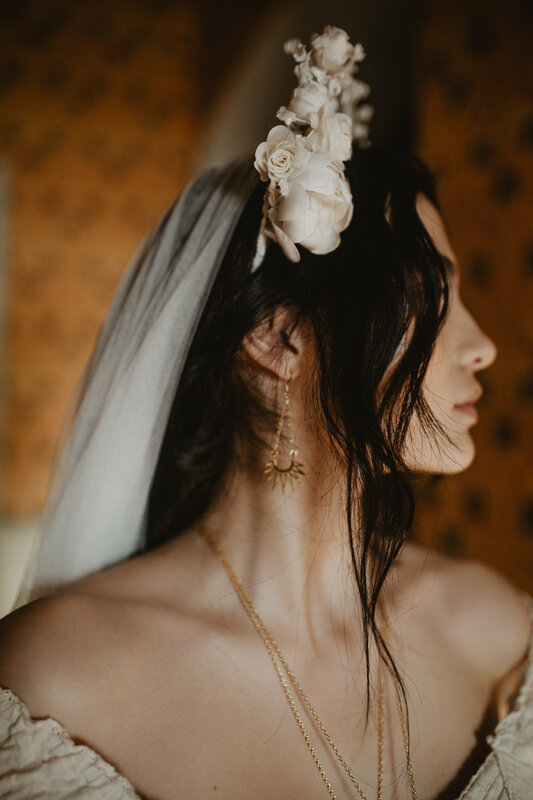 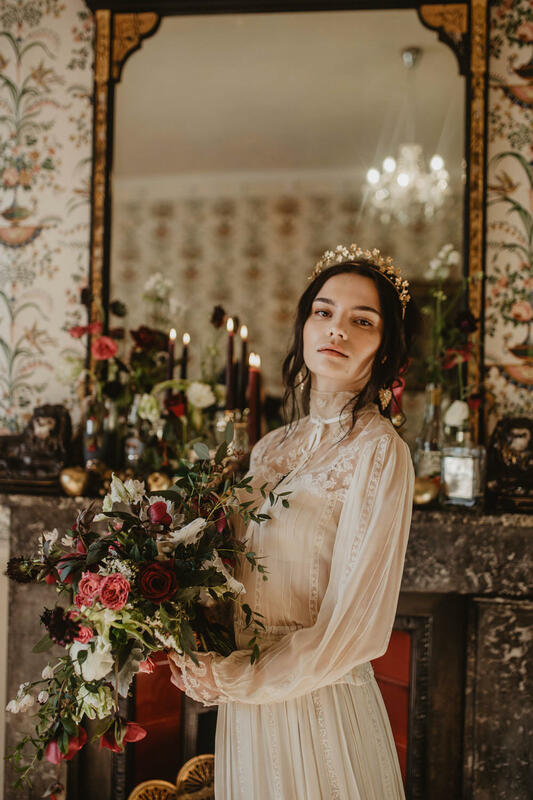 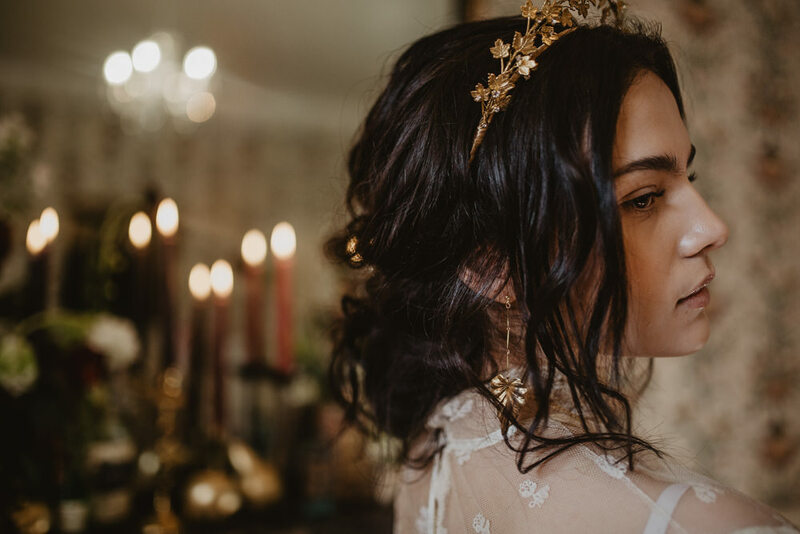 The bride wore vintage pieces with an Edwardian vibe, complemented by strikingly beautiful hair and make up looks not to mention pretty jewellery. 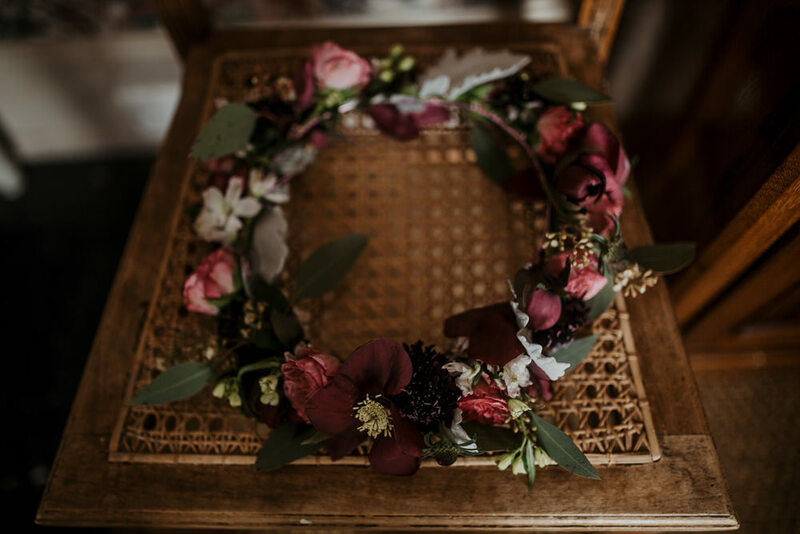 Finally I must shout out about the flower arrangements, the bouquet and flower crown were just exquisite. 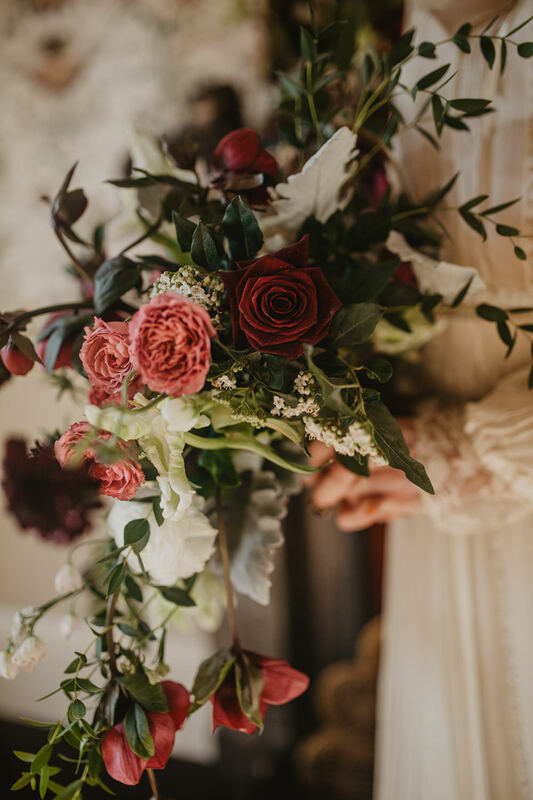 Enjoy it all folks. 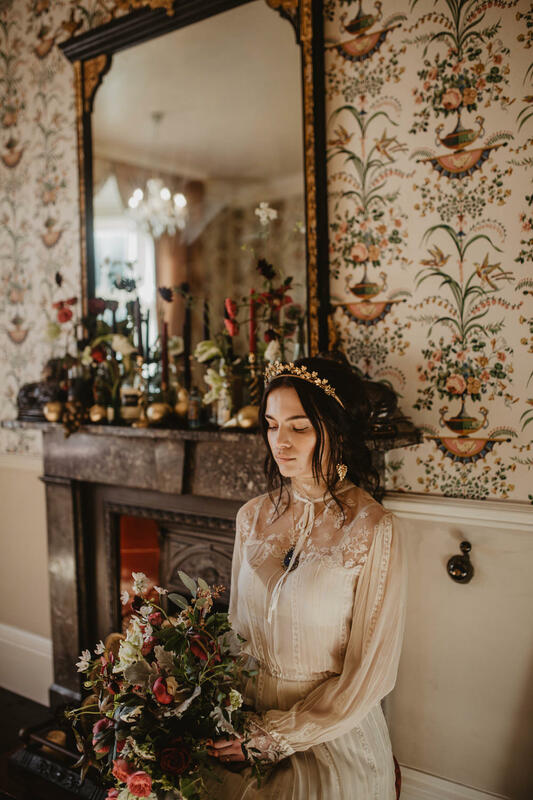 Our theme was inspired by luxury Edwardian fashion so we concentrated on using gold accessories, deep rich colours and vintage laces, all things reflective of that era. 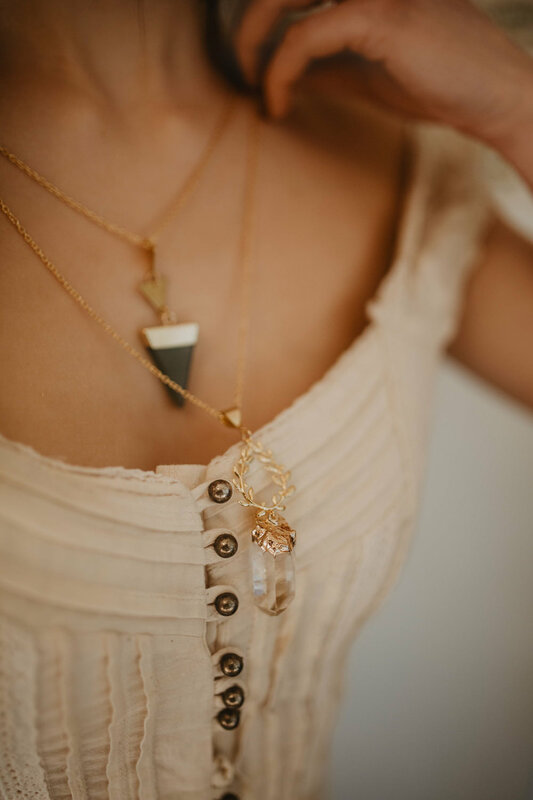 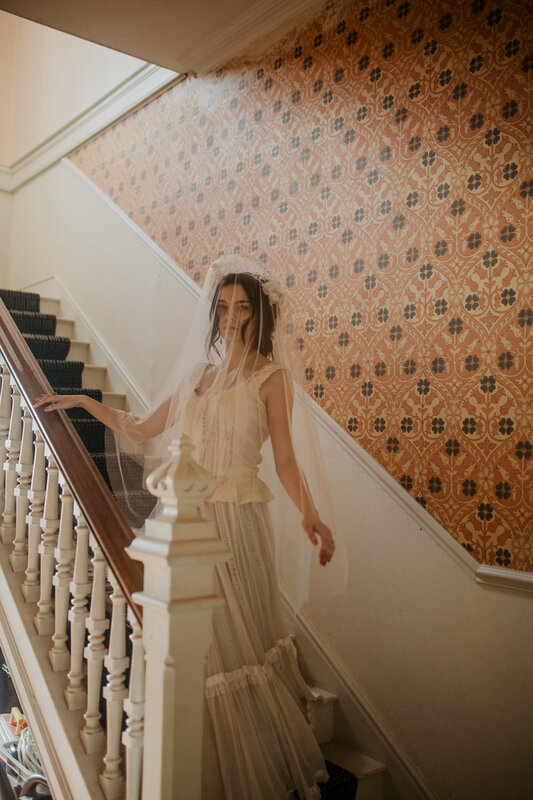 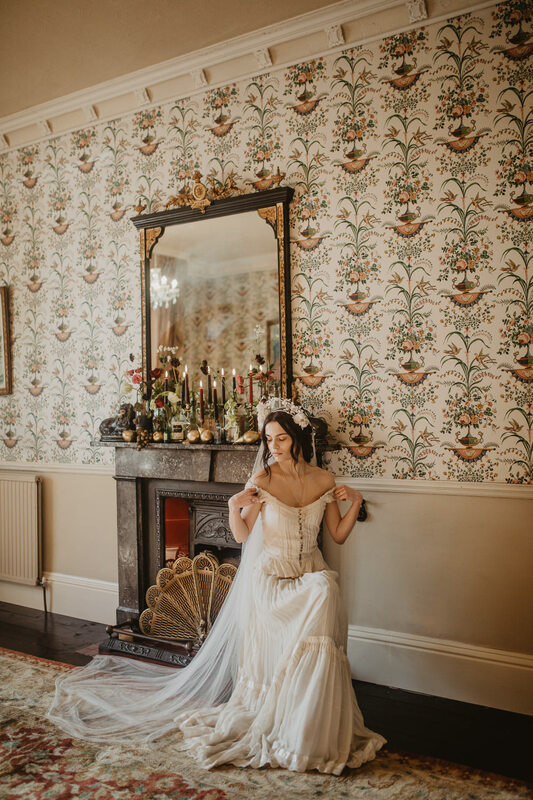 We used all vintage ivory pieces that could be dressed up as bridal wear and mixing and matching tops with a vintage David Fielden skirt creating three different looks. 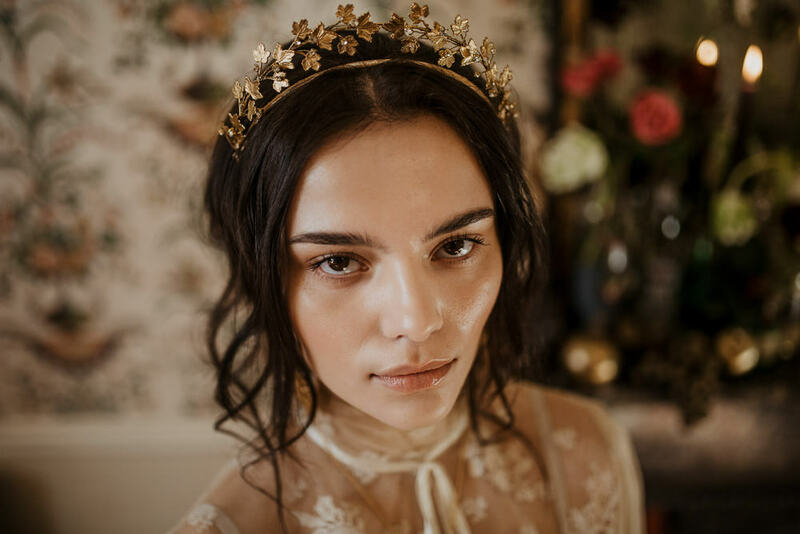 We completed the outfits by using stunning statement crowns and veil by London based designer Agnes Hart and we teamed those up with elaborately detailed jewellery by Eclectic Eccentricity. 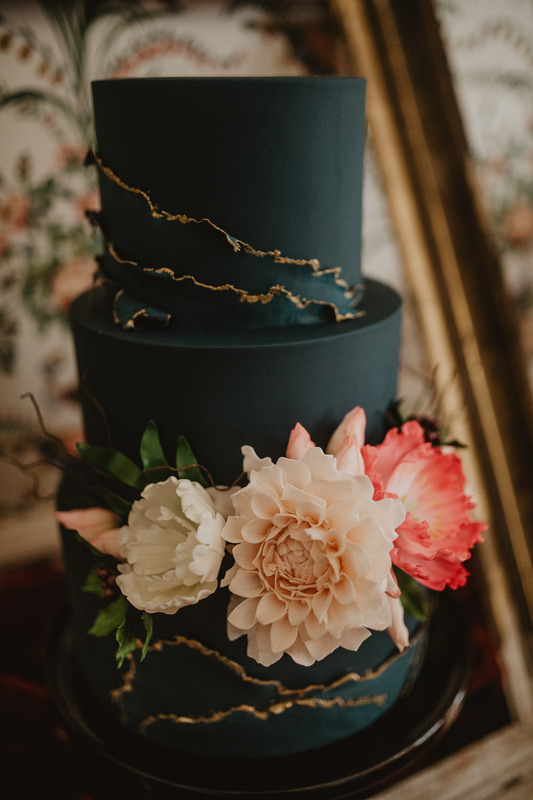 Our amazing cake was made by Amber at Love Wedding Cakes, she was inspired by the deep, rich colours of an Edwardian Oil portrait painting. 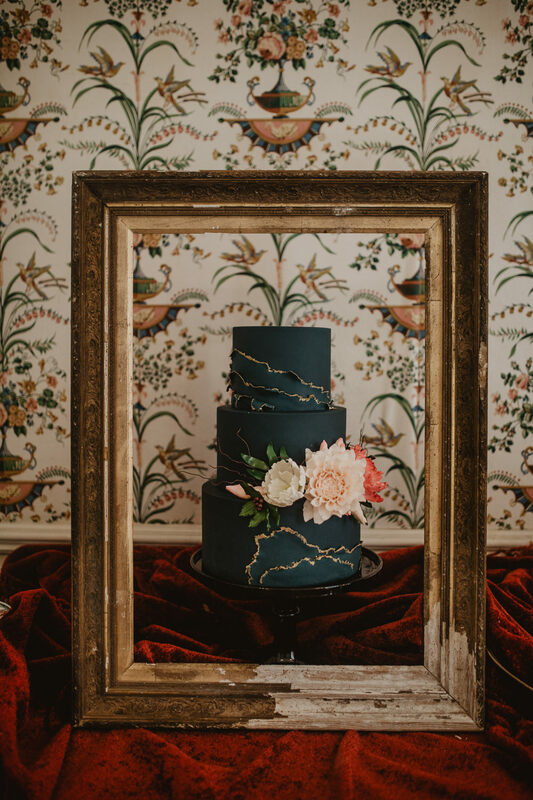 The sugar flowers were framed by gilded edges of torn icing. 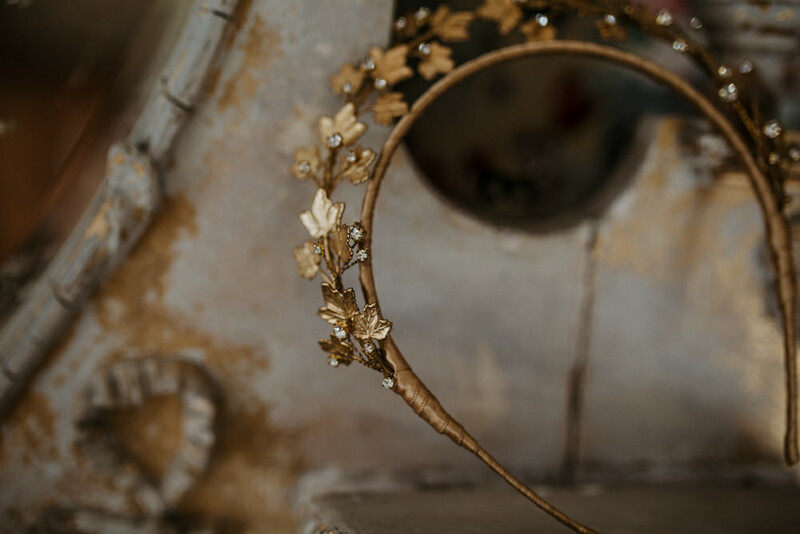 My work is heavily watercolour in style, with a focus on natural elements and florals in particular. 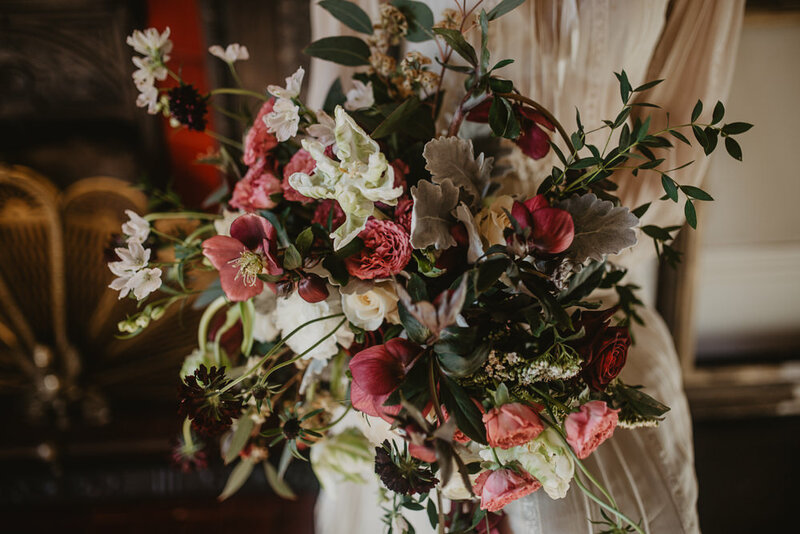 I chose sets with pink, creams and whites as focal colours to complement Camilla’s chosen palette. 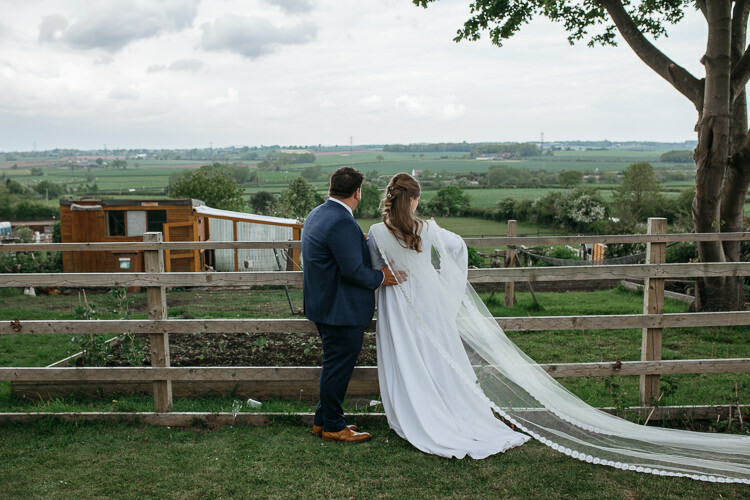 When Camilla approached me, I was delighted to work with her once again. 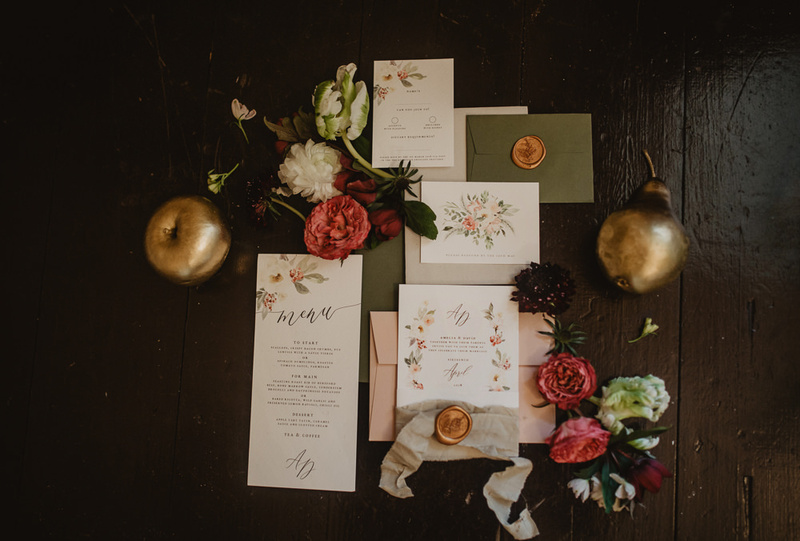 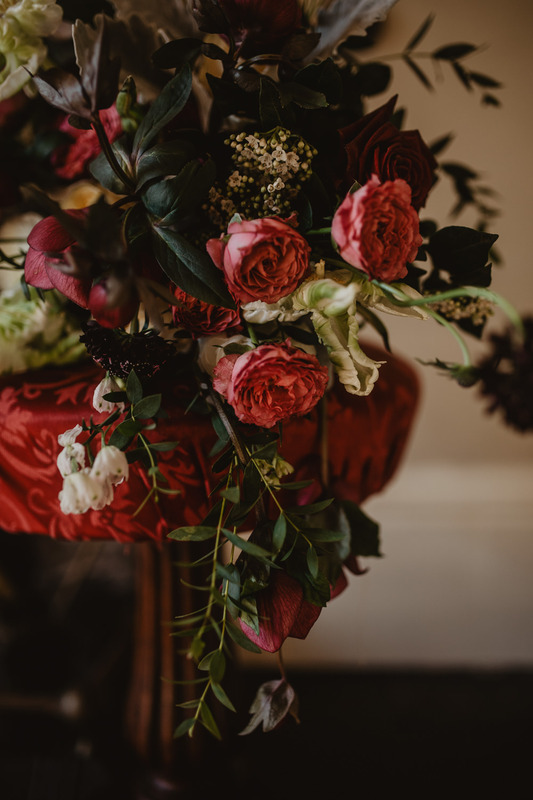 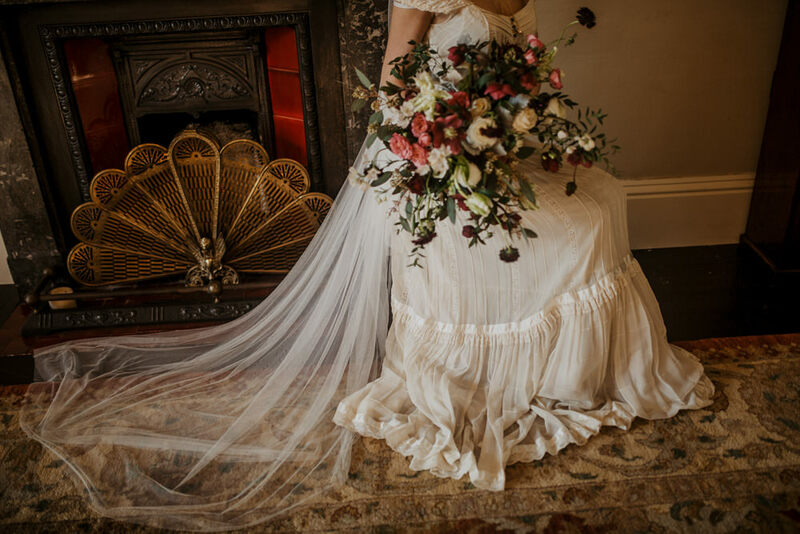 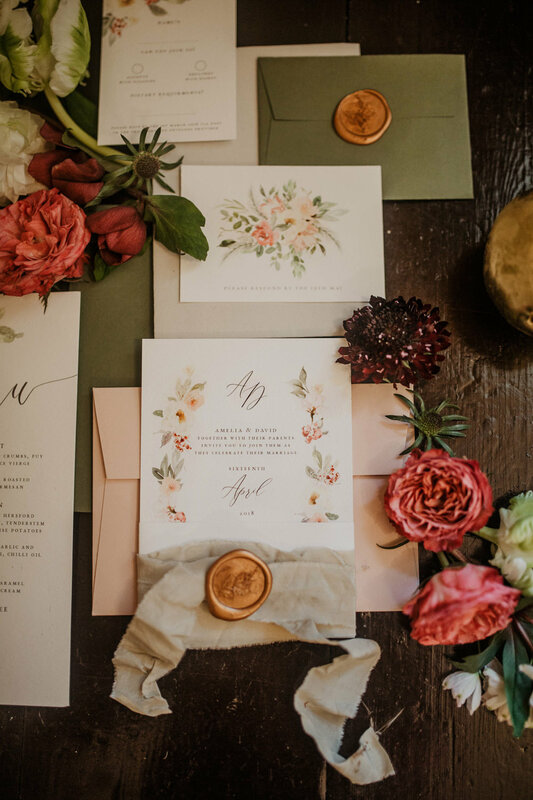 I love to see mismatches of some of my different suites and designs flatlayed together, and I think this approach worked really well for this shoot, with all the layers of florals and textures utilised across the day. 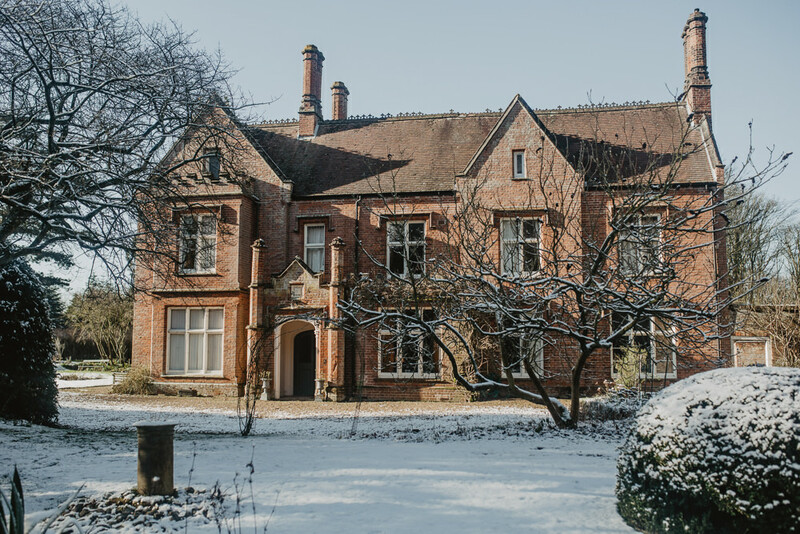 Our location for the day was at The Old Rectory at Great Melton in the heart of rural Norfolk. 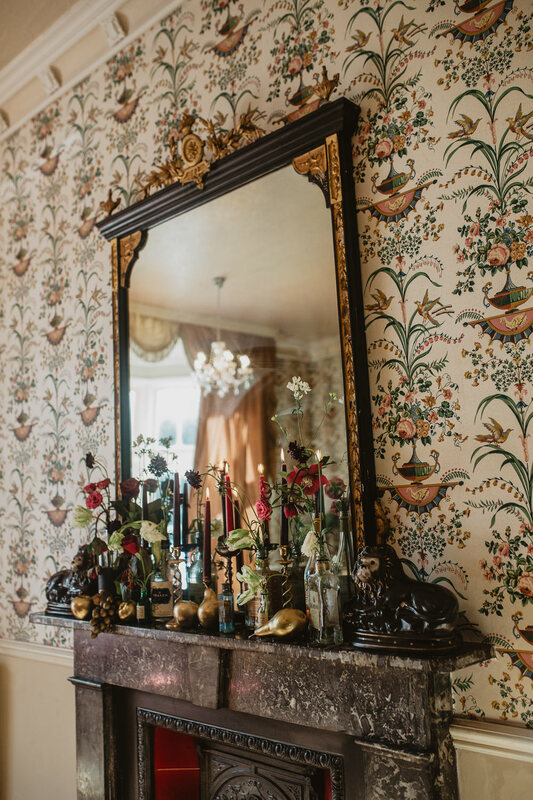 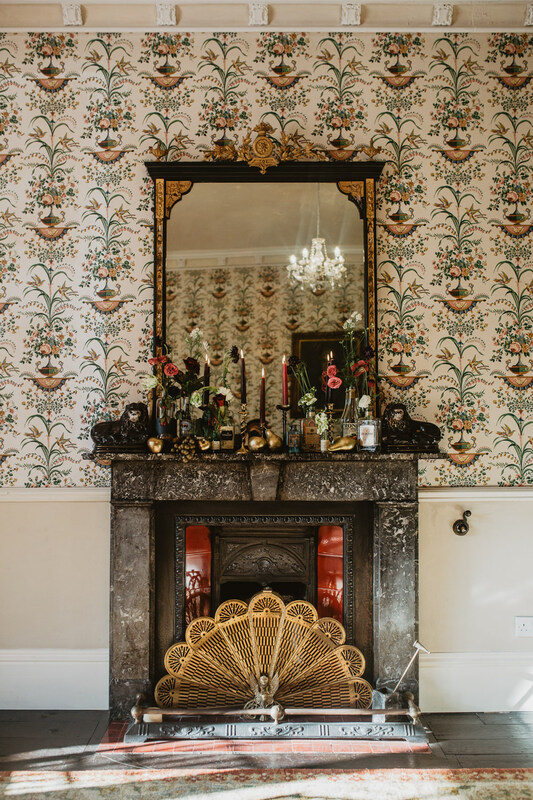 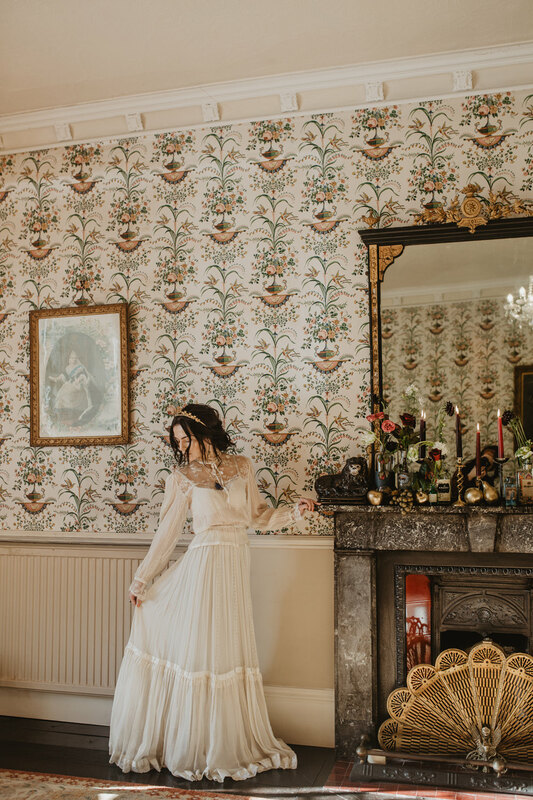 A Victorian built house which I previously had the pleasure of shooting a real wedding at years ago and instantly fell for its charms and quirks. 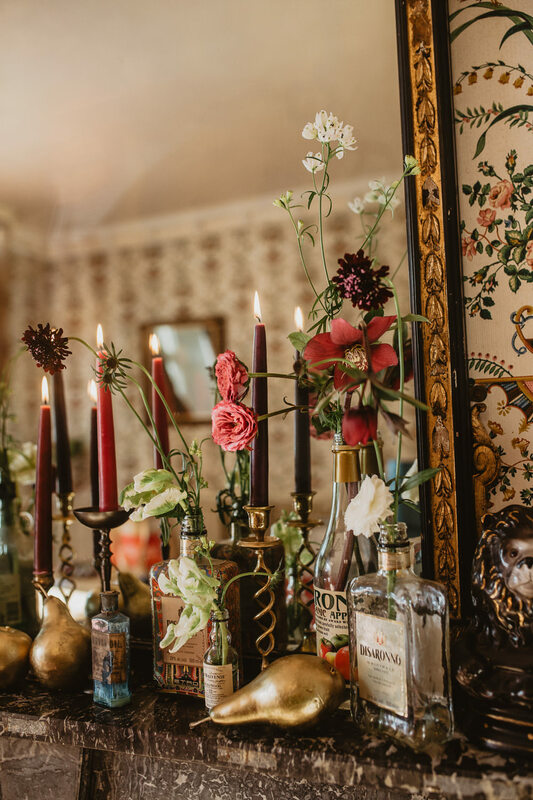 It was the perfect setting for our historic vintage theme! 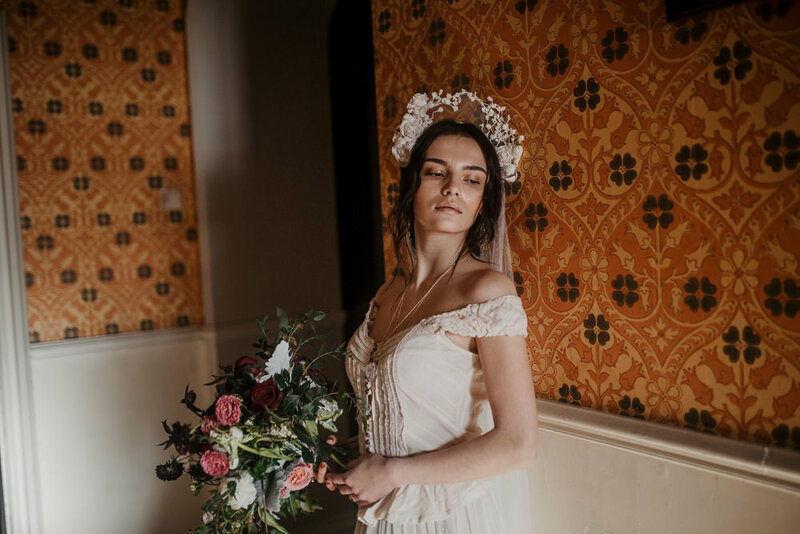 It’s such a versatile place, ideal for a country rustic wedding with an outside woodland area to marry in or room for an elegant indoor big day, where you could use the drawing room which we shot our photo shoot mostly in. 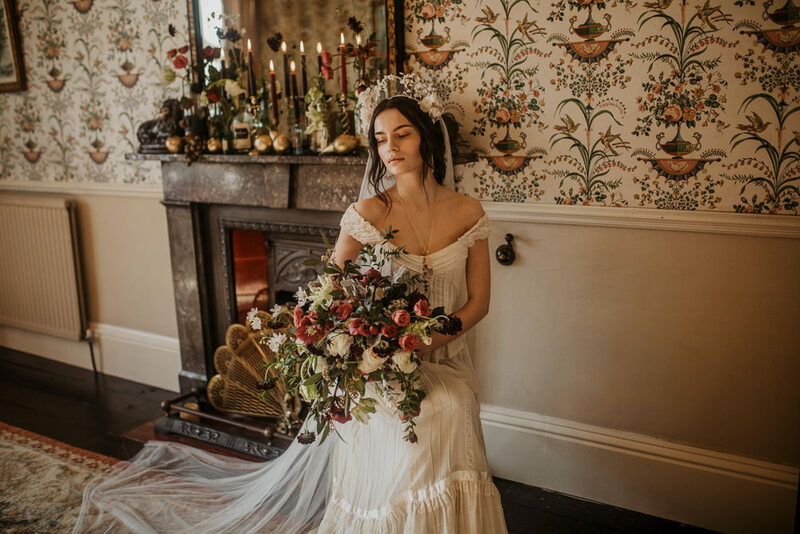 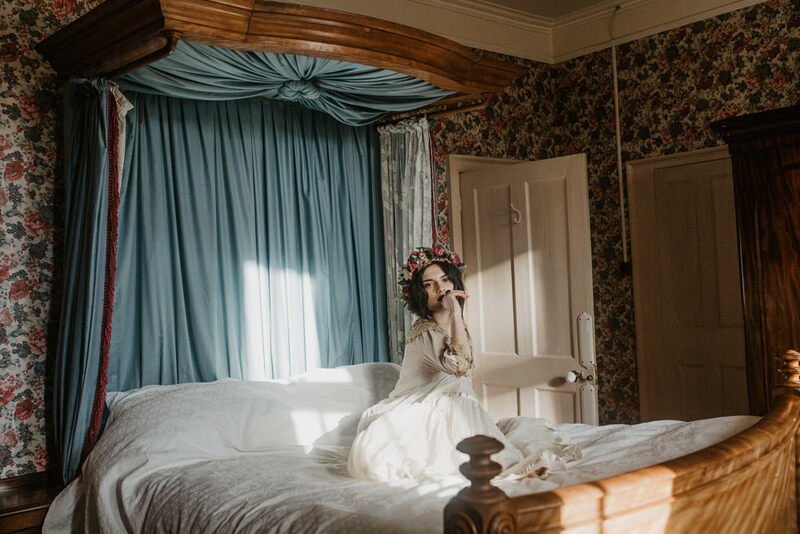 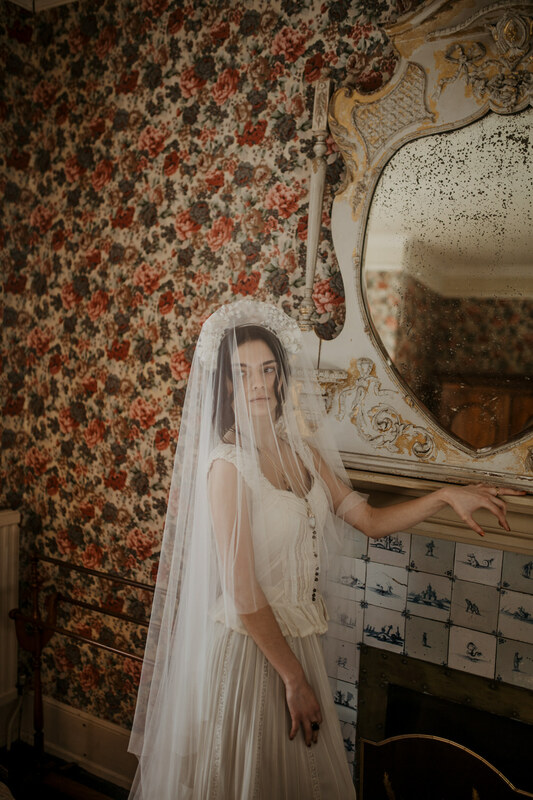 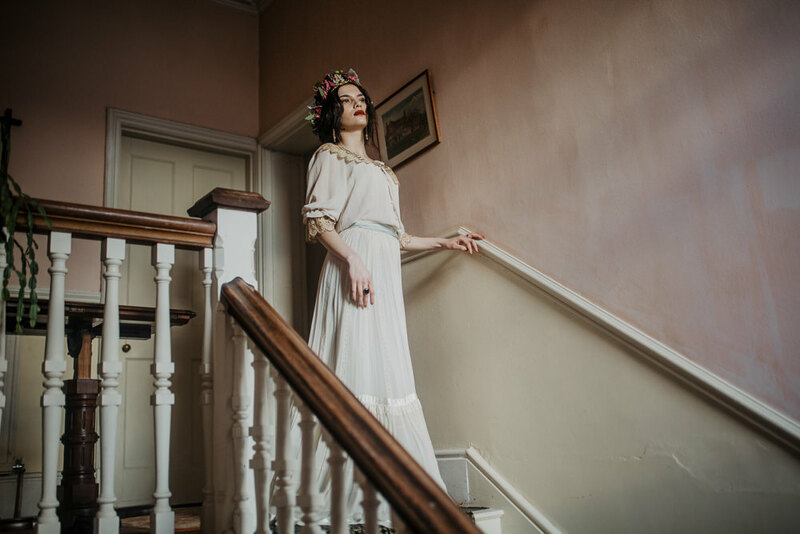 The main reason I initially wanted to do an Edwardian theme was because I knew talented hair and make up artist Flamingo Amy would be game and we had wanted to do a styled collaboration on a styled shoot for a while now! 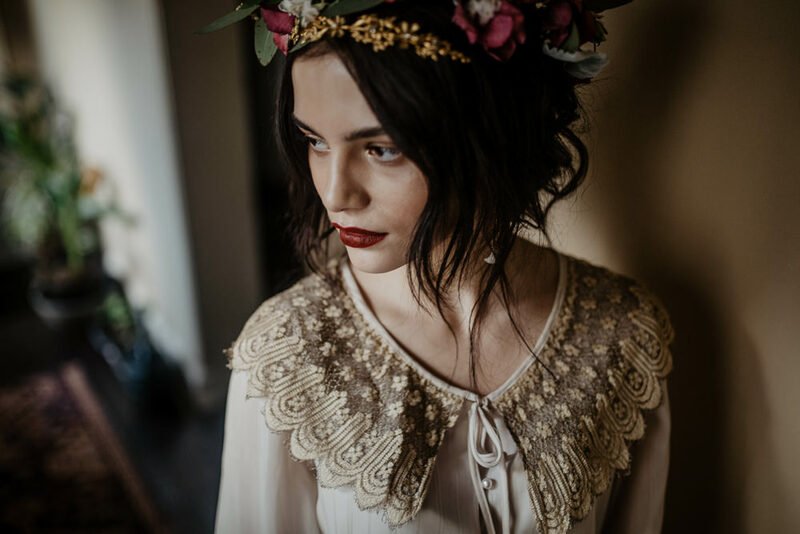 I have a love for historical fashion and love to mix the old and new together. 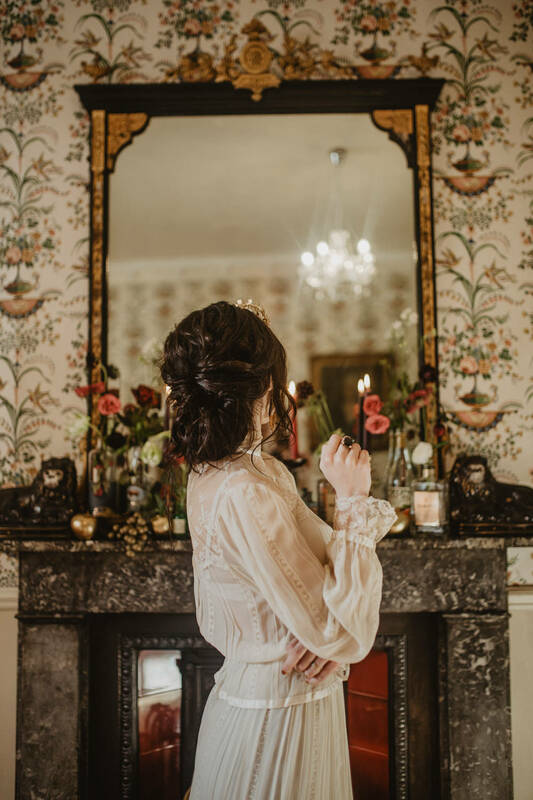 Having the perfect setting in a Victorian era house, with one of the dresses being quite Edwardian looking (it was in fact a 1970’s dress), I wanted to keep the make-up fresh and glowing, in that very modern way, and keep the hair quite textured, even though it was in a quite early 20th Century style, which would have typically been neater and more structured. 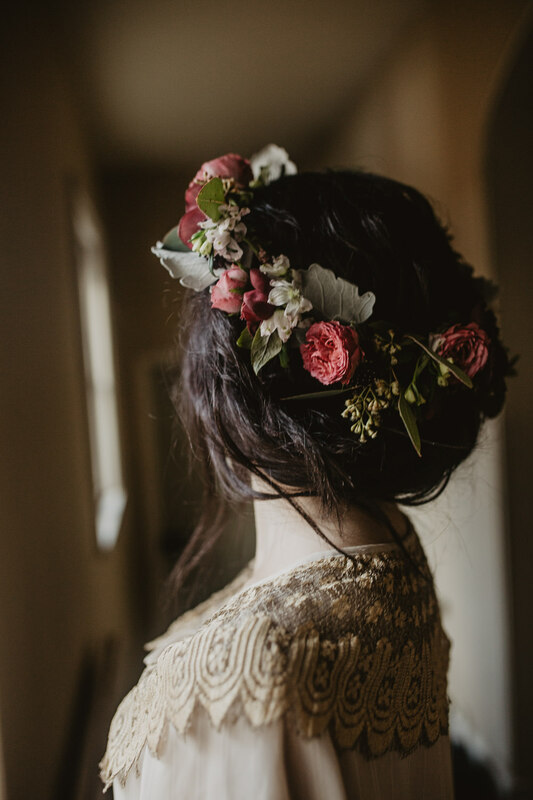 As the hair was quite soft looking, it was a style that could quite easily be worn by a modern bride today. 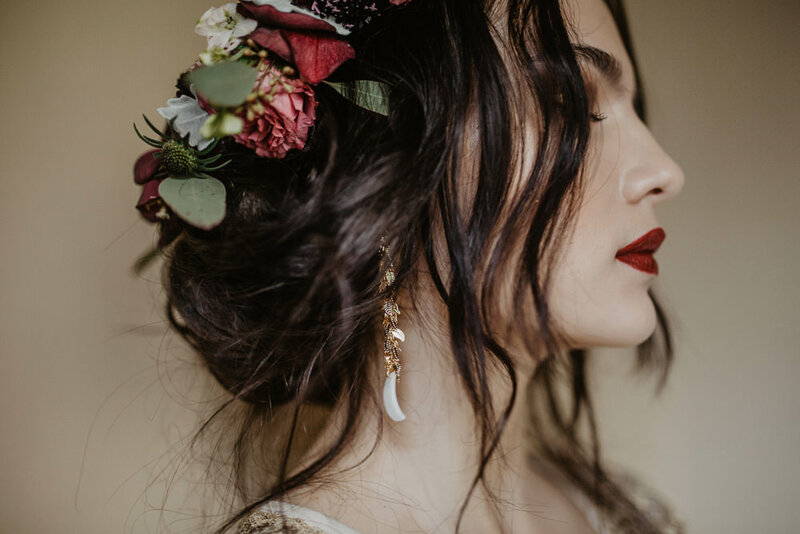 We added a dark red lip to compliment to beautiful deep tones in the bouquet, and some gold to the eyes to compliment the opulent style of the house. 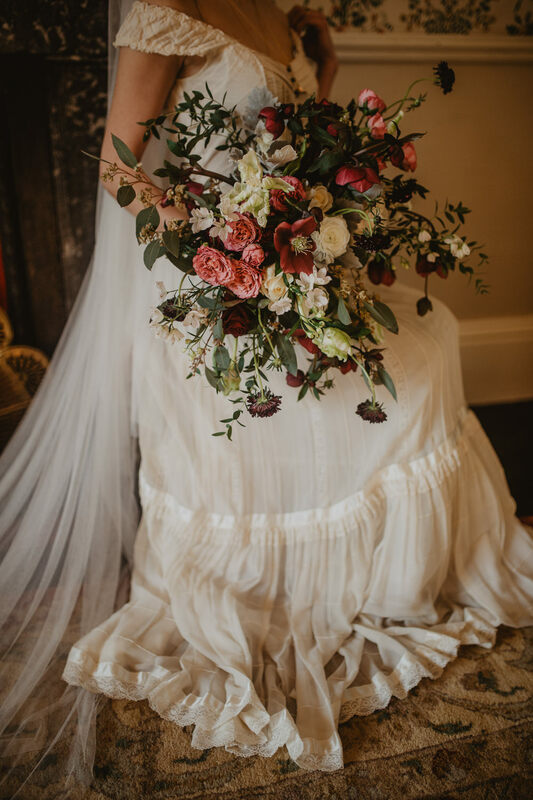 Our flowers were insane we had Ivy Floral Events put together gorgeous arrangements. 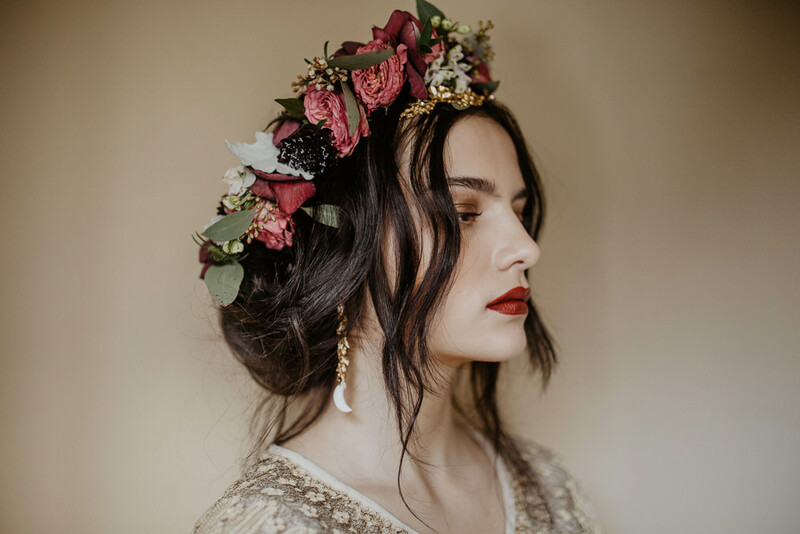 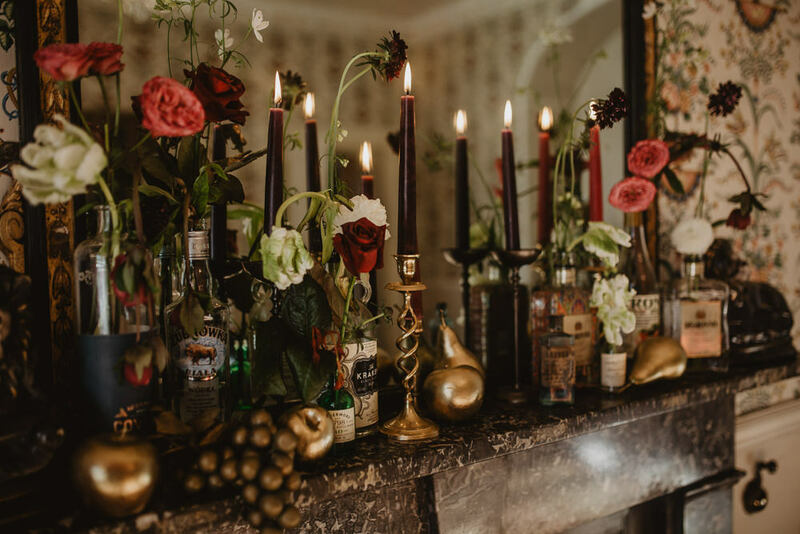 I wanted the flowers to have an opulent, luxurious feel, using deep, rich blackcurrant tones mixed in with warm champagne shades giving a lavish, majestic look. 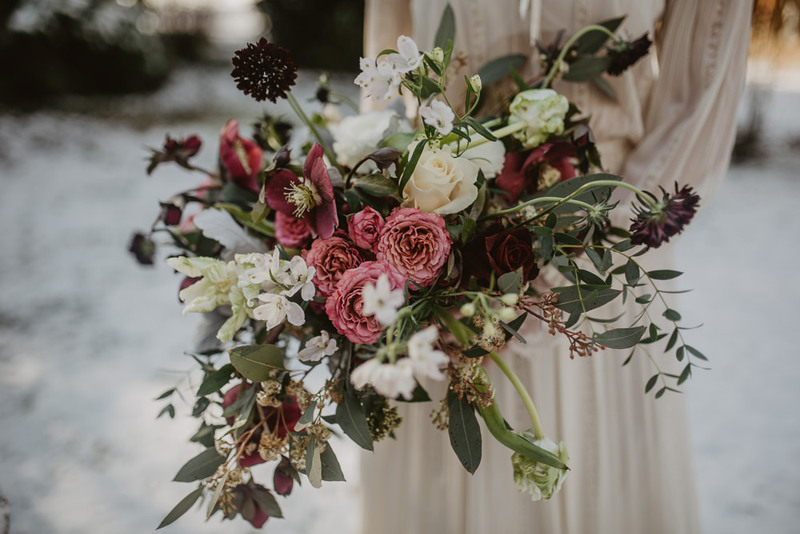 Spring blooms such as Hellebores, Ranunculus and Tulips were mixed amongst blowsy roses, spray roses, and scabiosa giving a relaxed, natural style.